JAM features a group of young artists from the next generation of Franco-Ontarian singer-songwriters. 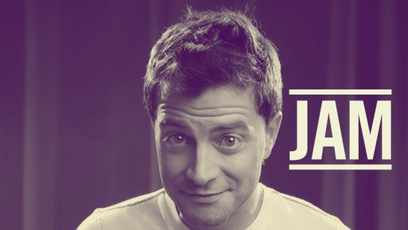 Hosted by Patrick Groulx, JAM is part road trip, part musical bootcamp and mentorship program for up-and-coming musicians as they work and play their way to their first big onstage gig at Montreal's FrancoFolies. Myriam takes on the extremely stressful challenge of writing a song about a mouse… in five minutes. Ceci est une capsule musicale tirée de l'émission JAM 4. PATRICK GROULX et MYRIAM ARSENEAU sont dans une salle de classe. facilement dans la vie? Non. le défi concentration de Jam? je montre pas mes chansons. là, écrire on the spot... Non. une chanson, paroles et musique. la guitare si tu veux. Non, on perdra pas de temps. En plus, on t'impose un thème. Le thème, ça va être "souris". Un chronomètre apparaît à l'écran. Il indique 5:00. MYRIAM commence son travail. Aussitôt, PATRICK revient! contente. On en a trouvé une. vous plaît la table de défi. Deux hommes arrivent en portant une table remplie de pièges à souris! Il y en a au moins une vingtaine. MYRIAM rit jaune. Les hommes placent la table devant la jeune femme. te mettre ça aussi. Au cas. PATRICK lui tend des lunettes de protection. MYRIAM reste concentrée et se remet à l'écriture. PATRICK GROULX revient à la charge avec un casque. Il le pose sur la tête de MYRIAM. Le chronomètre indique qu'il reste 2:19 au défi. aussi, je me le demande. PATRICK GROULX jette un ballon rempli d'eau sur la tête de MYRIAM. Évidemment, le ballon éclate sur la musicienne. Ce ballon tombe sur la table, ce qui actionne les pièges à souris qui se referment avec fracas. Maintenant, PATRICK jette des ballons remplis de confettis sur la tête de MYRIAM. Les confettis brillants virevoltent autour de la jeune femme. Puis, as-tu aimé notre défi? nous faire ta chanson, Myriam. monde, ça a juste... fini là. Eille, c'est super bon. Bravo. Everything since episode 1 has been building up to this event: the show on the Francofolies´ main stage. Putting a show together in three days is a lot of work, so we have to make sure that the participants get to have a little fun! Participants have come from all over the country to finally meet up in Montreal, where they also meet their producer. Getting up on stage to play a show can be a definite source of stress. Today, we´re looking at the three Ss of every artist´s career. Making music is great, but getting people to listen to it is even better. This video deals with the promotion side of things: the good, the bad and the ugly. Because light travels faster than sound, we see the artist before we´ve even heard a note of the song. Is that a good thing? Playing music is great, but earning a living playing music is even better! The participants tell us why they´d love to make a career out of music. Good lyrics and good music make a good song... in theory, anyway. We put this notion to the test in various circumstances. Some choose hockey, while others go for knitting. Our participants chose music. Why make music? And why keep at it? 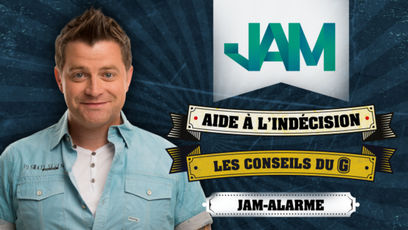 Get to know the new participants of the fifth season of Jam! Faouzia plays her song Mes cicatrices. Doressa has five minutes to write a song about walking... while Patrick plays a slide whistle, of course. Éléa and her friends perform one of her songs on the beach. Simon performs his song Gestes. Guyaume has five minutes to write the world´s most beautiful song about...? Minutes! Faouzia can lick her own elbow. She can also play the violin. Patrick´s mind is blown. Myriam plays her song Gare à toi. Catherine has five minutes to write a song about fountains. Can Doressa blow Patrick´s mind with her song? Doressa plays her song Je m´en vais. Faouzia writes a song on the arena window. The theme? "Through the window." Myriam and her band perform an Acadian classic, family-party style. From the very beginning, everything has been about this day. The show on the big stage at the Francofolies. Catherine plays her song Échapper au hasard. Got a difficult choice to make? Waste no time! Get on your smartphone or your tablet, ask the manager (Patrick Groulx) the question, give your device a good shake, and that`s all there is to it! The manager`s advice is going to be... hilarious! Seven young Franco-Ontarian singer-songwriters go on a thrilling adventure and play their way to the FrancoFolies de Montréal.